includes painting somewhere in a beautiful setting. She has painted on location in Greece, the San Juan Islands, Maine, Crested Butte, Guatemala, Nepal, and, of course, the Nederland and Indian Peaks area where she lives. 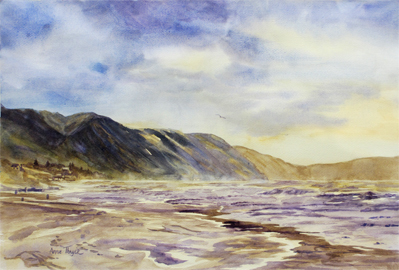 Many of her paintings are inspired by reflective time spent in these beautiful places. 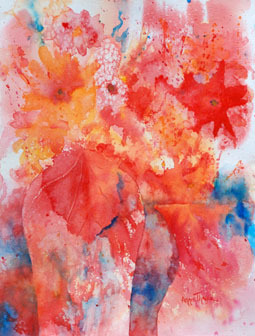 One of the things I love about watercolor painting is the playful nature of it. I am fascinated with how the paint moves and flows, creating a sense of motion and energy. I find my most interesting paintings are those I don't try to control. When I can remove the need to produce something and instead let my joy and a sense of discovery lead me into the painting, then it takes me where it wants to go. Watercolor painting allows me to combine my love of nature, color, and movement into a very satisfying creative expression. For me, painting is like a dance. I most often have to stand up while I'm painting so I can move with the flow. My desire is to work from my heart and capture what I'm feeling inside. The more I learn to do this, the more fun I have painting, and then I sing, "How can I keep from painting!" I hope you will find something that moves you or connects you with the places I love.